Sa’ada Yemen(ANn)-At least 18 people, including women and children, have been killed when Saudi warplanes carried out a number of airstrikes in an area of Yemen’s northern province of Sa’ada as the Riyadh regime presses ahead with its devastating campaign against the conflict-plagued country. According to Yemen’s Arabic-language al-Masirah television network, the Saudi aerial aggression conducted hit the Aqiq area of the Kataf district on Saturday, adding that among the dead were some medics who had tried to save the wounded from the initial strike. Earlier in the day, another Yemeni lost his life when his water-tank truck was directly hit by a Saudi airstrike in Wadi Moore Bridge on Hawdh Road in the northwestern province of Hajjah. 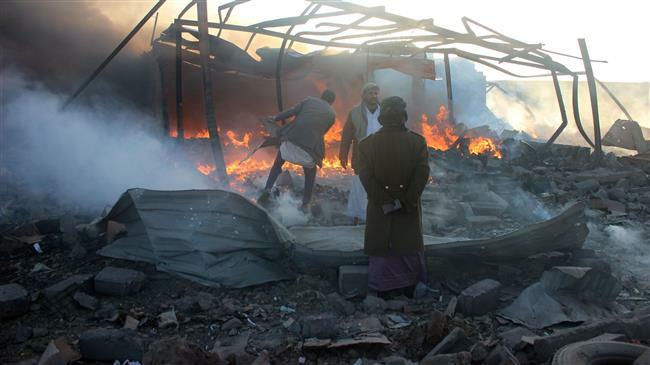 Since March 2015, the Saudi regime, together with a coalition of its allies, has been heavily bombarding Yemen as part of a brutal campaign against its impoverished southern neighbor. It has been attempting unsuccessfully to reinstall Yemen’s former president Abd Rabbuh Mansur Hadi, a staunch ally of Riyadh. Besides defending Yemen against the Saudi aggression, Ansarullah has also been running state affairs in the capital, Sana’a, in the absence of an effective administration. The Saudi campaign has killed at least 13,600 people since its onset. Furthermore, much of the country’s infrastructure, including hospitals, schools, and factories, has been reduced to rubble in the Saudi war. According to the World Health Organization’s latest tally, the cholera outbreak has killed 2,167 people since the end of April 2017 and is suspected to have infected 841,906. Additionally, the UN has described the current level of hunger in Yemen as “unprecedented,” emphasizing that 17 million people were food insecure in the country. The world body says that 6.8 million, meaning almost one in four people, do not have enough food and rely entirely on external assistance.